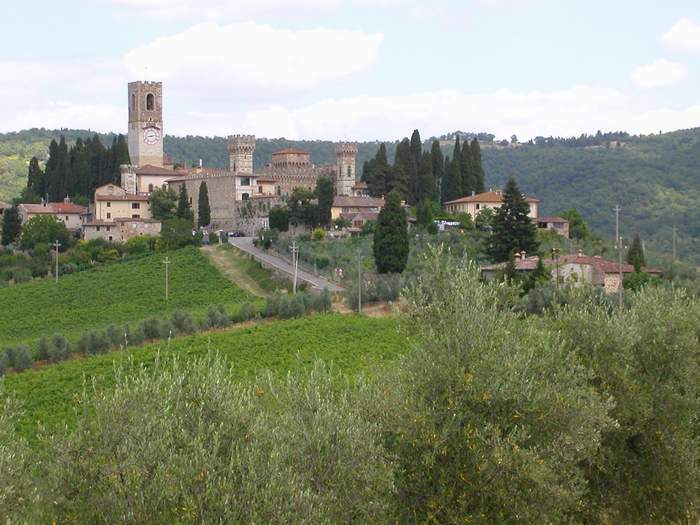 The very name Badia a Passignano suggests its origin in the religious community which certainly already existed in the 9th century, with the presence of Sichelmo and bis brother Zenobio. After 1000 A.D. the community was entrusted to the Benedictine monks from Vallombrosa, who were committed to a new, reforming movement under the guide of their founder, Sto Giovanni Gualberto, who died and was buried in the Badia a Passignano in 1073 A.D. 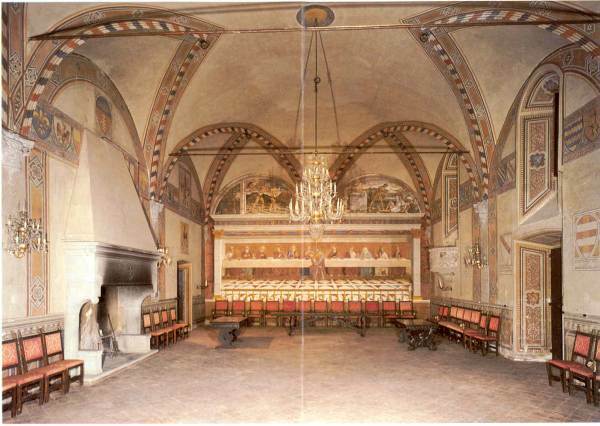 The religious, political, economic and social life of the monastery of Passignano over the centuries is recorded in the invaluable patrimony of documents the majority of which are housed in the state archives in Florence. The church, which was completely altered in the Baroque period, still maintains its Romanic facade and the beautiful, solid bell tower which dates from 1200. The interior, however, with its works of art, such as the wooden choir dating from 1549 and frescoes by various 16th century painters, is not lacking in dignity and extraordinary beauty. 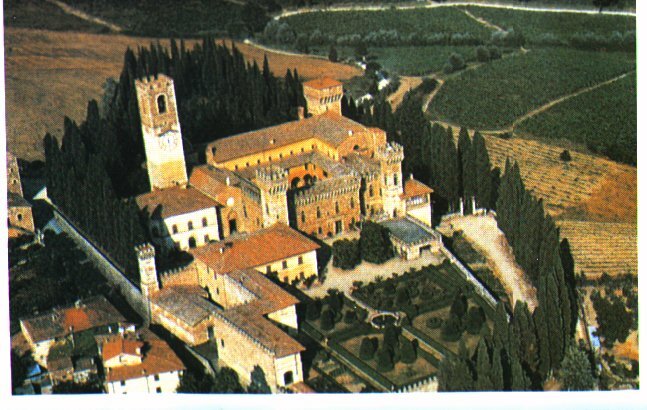 Most of the present construction of the monastery dates back to the 15th century, which was also the period in which Domenico Ghirlandaio painted the "Last Supper" in the monumental refectory. After the Council of Trento the monastery became a centre of theological, literary and scientific studies; in 1588 Galileo himself, who was a pupil of the abbaI of Passignano, taught mathematics bere. With the suppression of the religious orders by the Italian govemment in 1866, the historic monastery became private property and part of the exterior was rebuilt, giving it its present appearance of a Gothic castle. After 120 years the Benedictine monks of Vallombrosa, who had always remained faithful custodians of the church and tomb of the founder saint, retumed once more to the monastery. Take it easy. After a long journey, a very frustrating visit in an overcrowded museum, a bad lunch in hurry to be ready for the next visit what is better than a relaxing sun bath or a swim in the perfect place ? 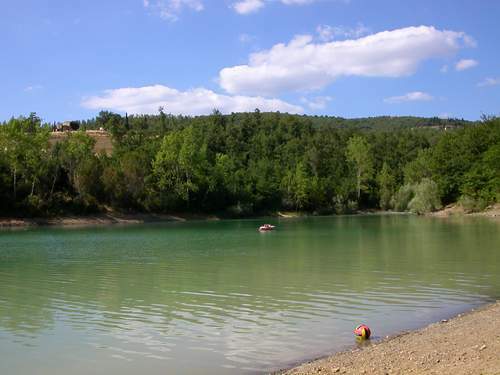 I'm speaking of the Badia Lake. It is not easy to find it anyway. 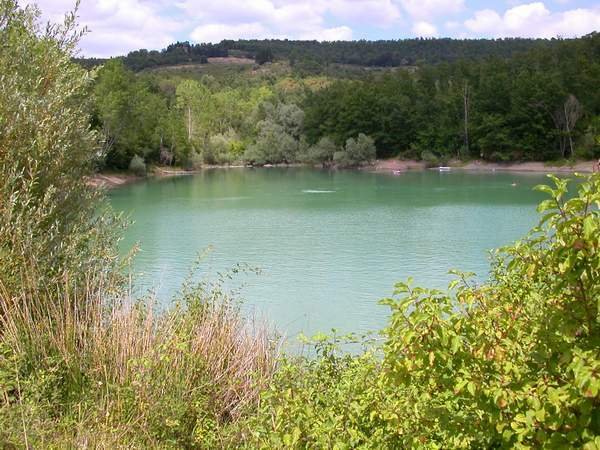 It is an artificial little lake near the abbey of Passignano (another small village). You have to reach Badia a Passignano and you can also stop there to buy something to eat at the restaurant bar "La Scuderia" along the main road. I have to tell you that the wine there is not so good. To reach the lake take the first road on the right. A very little country road with many dust if you go fast. Go on for quite 500 m than before a very very little bridge you have to enter in the country, litterally off-road and going on only for 100 m. Than the prudence suggest to leave the car under the trees to still have a car to come back. If you have a truck or a jeep you can enjoy the latest 50 m of very rocky and damaged truk to finally reach the dreamed lake. There is no sand but you can be enough comfortable on a towel. 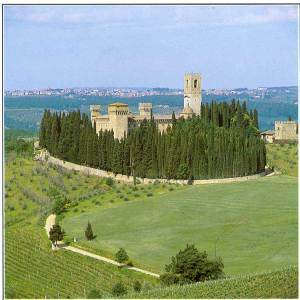 The Chianti region is quite dry in the summer so you can enjoy a nice water until the half of july. 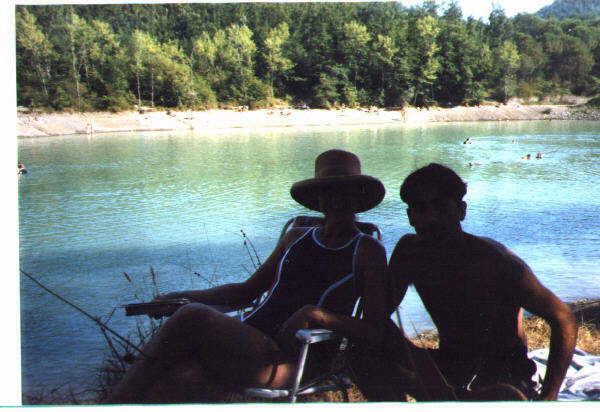 After that time the level of the water decrease and there is very little to swim and in a water that is not very nice.Then you are surrounded by a wood and if there is some wind you can enjoy and refresh yourself. The water is never cold and the only problem may be that it goes in deep rapidly so if you are not a very good swimmer keep yourself out of the water. That is not a place where you can have a swim. Sometimes police come to see if anybody have a swim ..... But .... how to resist ? So be prepared to fight hard to get a place to lye or to gain the possession of a tree in the water. After a day at the lake you really understand a little bit more of the Chianti way of life.